Working with Herald Journal Sign & Graphics of Winsted, Minnesota, the Signs By Benchmark team is creating a custom mission style monument sign for installation at a new care center facility. The double-sided 9′ 6″ wide x 6′ 3″ high by 28″ deep sign features a three color acrylic stucco finish designed to match exterior features of the facility. Copy coated directly into the sign face will provide a seamless finish and lasting durability. Created from cellular plastic finished with Signs By Benchmark’s signature hard coat, the lightweight sign will first save on shipping costs. Then, during installation, it will help save more when heavy equipment is not required. 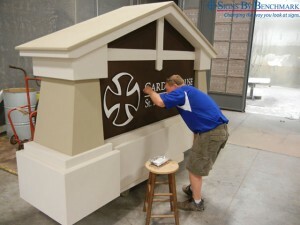 Call the Signs By Benchmark team with your next project details, whether you need a standard monument or a custom design. Known for their ability to turn unique exterior or interior sign and sign accent (bases, pole covers & sign tops) ideas into reality, they will work closely with you to ensure complete satisfaction. Give them a call at 800-658-3444 or 605-886-8084. 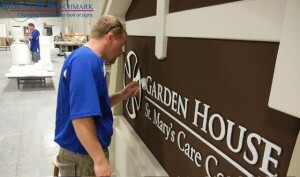 To view photos of some Signs By Benchmark products, click here.